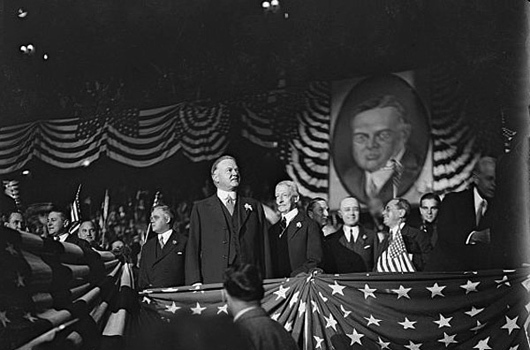 On October 22, 1928, Herbert Hoover gave the penultimate speech of his successful presidential campaign entitled, “Principles and Ideals of the United States Government.” In that speech, the self-made millionaire expressed his belief that the American system was based on “rugged individualism” and “self-reliance.” Government, which had necessarily assumed unprecedented economic powers during World War I, should retreat, and cease to interfere with businesses. During the early days of the Great Depression, Hoover launched the largest public works projects up until his time. But he continued to believe that problems of poverty and unemployment were best left to “voluntary organization and community service.” He feared that federal relief programs would undermine individual character by making recipients dependent on the government. He continued to prioritize the concept of “rugged individualism” even in the face of monumental economic catastrophe. Herbert Hoover’s rugged individualism is considered a virtue by many. It is thought, by those who subscribe to this philosophy, that people should be self-reliant and self-sufficient. From the point of view of The Fearful Mindset, with its assumption that individuals are separate, independently existing beings, rugged individualism makes perfect sense. If we each exist independently then we are each responsible for our own well-being. From this perspective, we must each look out for ourselves. In so doing, the theory goes, we will create a society led by the fittest among us. But even if it is true that rugged individualism produces ‘strong’ leaders, those leaders would be operating under the values of The Fearful Mindset that they have held throughout their lives. Such leadership would be ill-equipped to deal with the problems we are facing today because these very problems have arisen out of The Fearful Mindset in the first place. As mentioned in the article from the University of Virginia above, even Herbert Hoover, the person who coined the term “rugged individualism”, was unable to strictly adhere to his own philosophy when circumstances prevented him from doing so during the Great Depression. As set out in The Hopeful Mindset, there are values particular to The Fearful Mindset that arise out of the assumption that individuals are independent, separately existing beings. Human values arise in response to human survival needs. We come to value those things that we perceive to be helpful in meeting our survival needs. But what we perceive to be helpful in this regard is entirely dependent on how we perceive our existence in the world. When we believe ourselves to be separately existing beings we will tend to value those things that we think will support this kind of independent existence. For example, given the human need for security, those who believe that they are independent selves will seek to accumulate resources as a means to protect themselves against possible future resource shortages. Whenever a resource is in limited supply such individuals will seek to accumulate as much of the resource as they can for themselves. This, in itself, can cause shortages for others, leaving them unable to meet their needs for that particular resource. There are innumerable other relatively common problems caused by The Fearful Mindsets assumption regarding independently existing selves and things. The reason for this is simple, that assumption is flawed. As scientists probe the nature of reality the picture that is emerging is not a universe of separately existing phenomena but, rather, a universe of interacting phenomena. Seemingly separate ‘things’ arise within these interactions. No ‘thing’ exists independently or separately from the interactions in which it arises. Rather than living in a world of independent things, we live in a world of interdependent, interacting phenomena. If this is the case, how should we meet our survival need for security? Within The Hopeful Mindset values arise out of a deep understanding of the implications of our interdependent existence. The value related to the need for security in this mindset is sustainability. It is understood that where resources are limited we must establish ways to replenish what we use rather than selfishly accumulating and hoarding finite resources. Rather than solely looking out for number one, the individual that recognizes the interdependent nature of his or her existence knows that everyone needs to look out, not only for themselves, but for everyone else in the process. Herbert Hoover’s idea of rugged individualism grew out of The Fearful Mindset’s assumption that we are independent selves in a world of independently existing objects. Because it is based on a faulty view of reality, rugged individualism is in conflict with the interdependent nature of our existence. When we make the shift to align our understanding of our selves with the reality of interdependence we place ourselves in harmony with our human nature and the nature of the world in which we live. Where rugged individualism has failed to provide effective leadership, interdependent individuals work together in concert with nature to cultivate a sustainable world; a world worth living in.